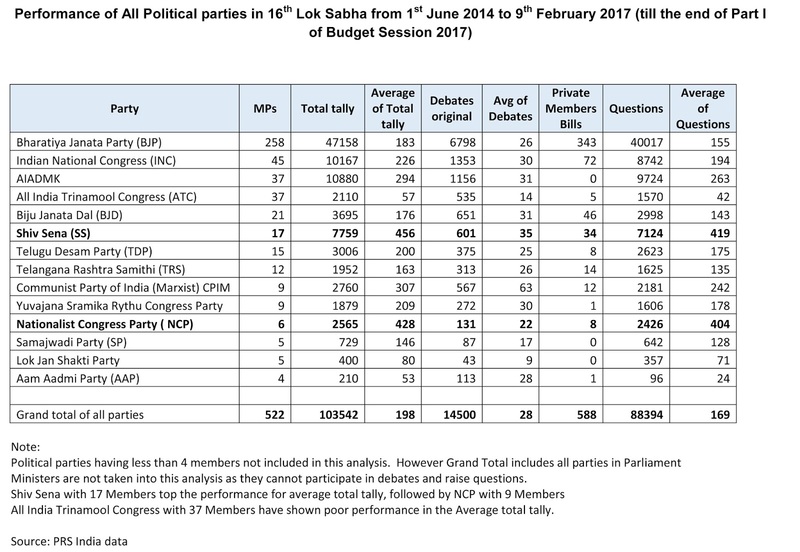 We furnish below an analysis of the performance of our Lok Sabha Members up to the end of Part I one of Budget Session 2017. 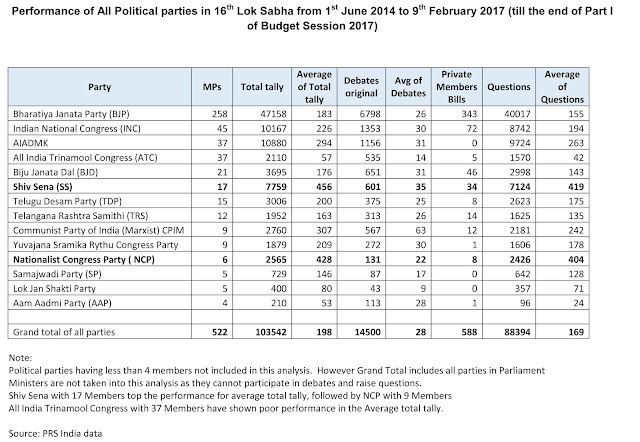 The data relates to the period from 1st June 2014 to 9th February 2017. The second part of Budget Session starts on 9th March 2017. Hence, we are releasing this analysis now so that the Members may improve their performance further. 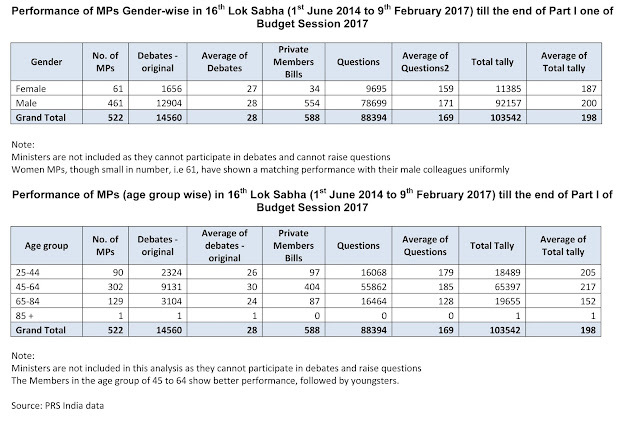 Sansad Ratna Team has analysed the performance state-wise, party-wise, gender-wise , term-wiseand agegroup-wise. Please go through the interesting facts. 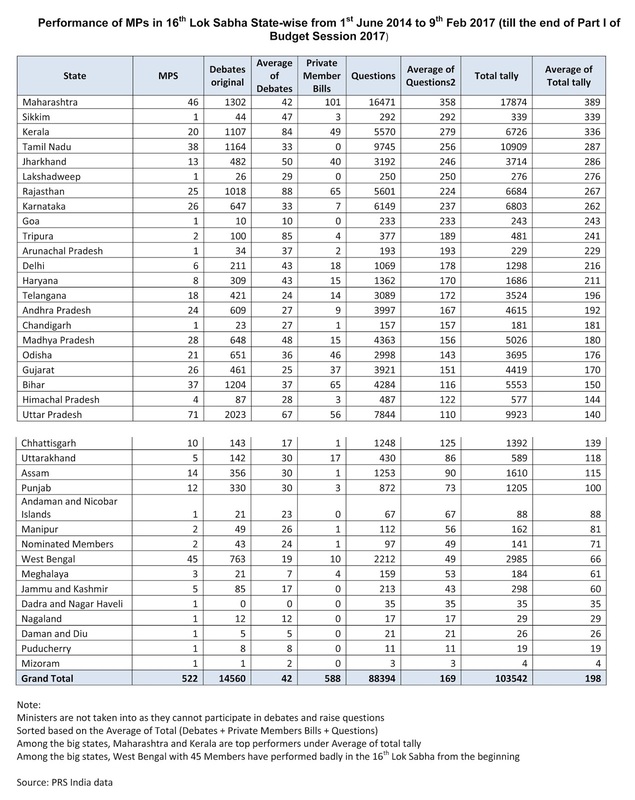 Among the bigger states, Maharashtra and Kerala have done well. 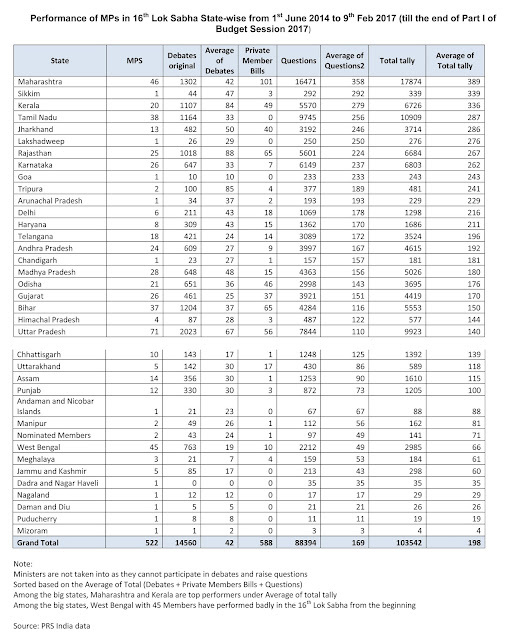 West Bengal with 45 Members has shown a bad performance. Among the political parties, Shiv Sena and Nationalist Congress Party have shown good performance. In spite of having 37 members, Trinamool Congress has shown the bad performance. 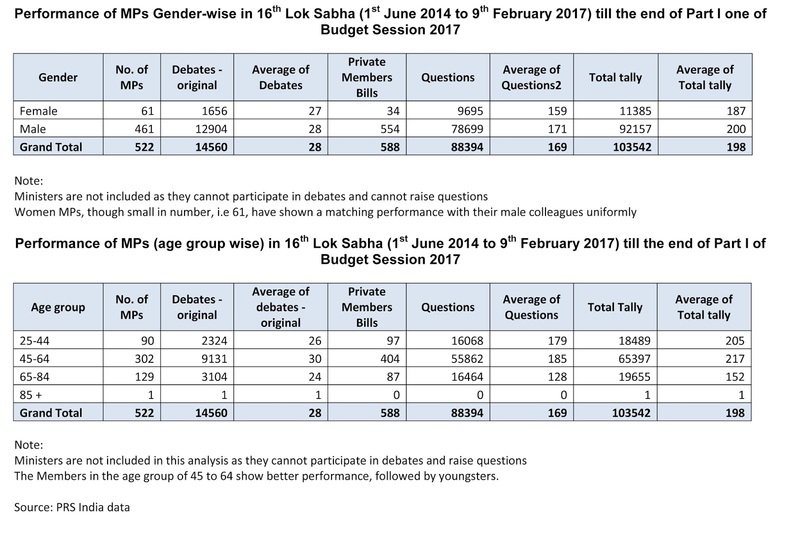 Uniformly women members have shown good performance matching with their male colleagues, though they have only 61 members. The members in the age group of 45 to 54 have shown good performance closely followed by younger members. Third term and second term members have shown good performance. 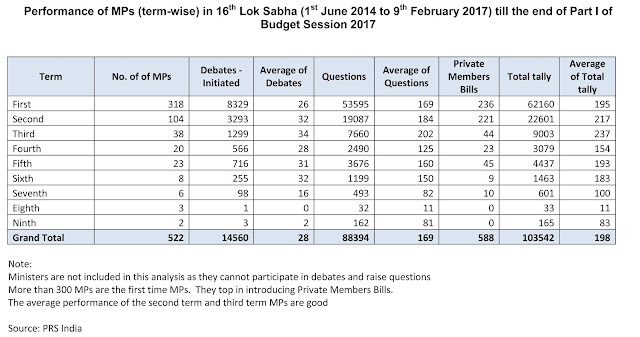 More than 300 members are first term MPs. 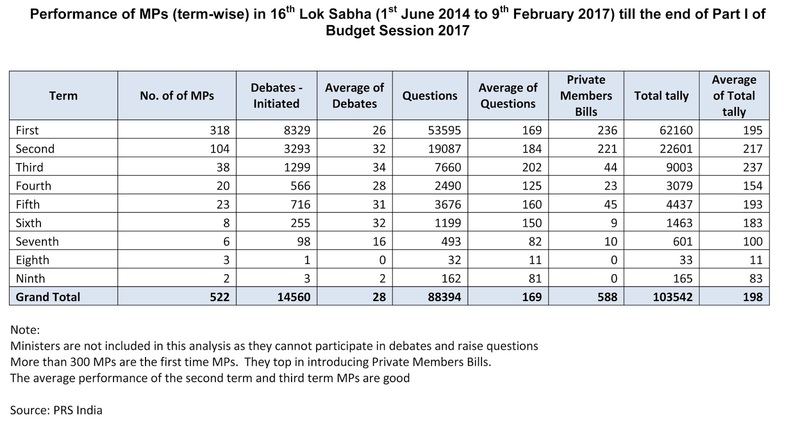 For the purpose of analysis, we have not taken into account the Ministers, who are not eligible to participate in debates and raise questions.